Thank you to everyone who recently completed our SCIS Publisher Survey. We received an incredibly impressive 1,162 responses – so we now have plenty of rich data to analyse, and a lovely list of publishing house suggestions. Below are some key themes that emerged from the results. We asked respondents, ‘If you purchase books from a publisher and there are no matching SCIS records, what do you do next?’ Forty-seven per cent of users catalogue the titles yourself (some referring to a ‘similar’ SCIS record or other library sources to help guide you), and 32 per cent put the books aside and check a week or two later to see if SCIS records become available. 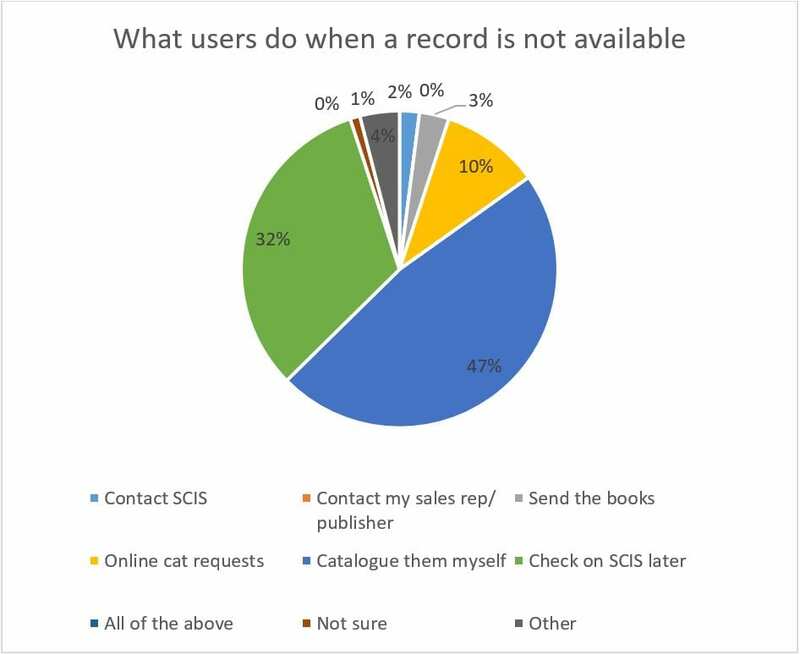 While there are few surprises in these results, interestingly, only three out of 1,162 respondents contact their local publisher/bookseller or sales rep if SCIS records are not available for their recently purchased books. And only 33 of you contact SCIS directly to let us know if a publisher’s titles are missing. As a cataloguing community, we rely on feedback to keep our hit rate high. So if you ever have an opportunity to mention SCIS to your local bookseller, or let us know directly, everyone will benefit. Please take a moment to look at the amazing publishers who already support us. Not everyone is aware that we have online help articles that you can find by clicking the help icon on the SCIS website. We also have a friendly customer service team, Sarah and Helen, who can help you troubleshoot issues and streamline downloading. We also have cataloguers (Renate and the team) across Australia and New Zealand on hand for cataloguing queries. Please check out our website, or email help@scisdata.com with any queries you have. We have a lovely list of new publishing houses to contact. Any feedback about catalogue records has been passed to our quality assurance manager. We will continue to work with publishers, distributors and library staff to keep our hit rate as high as possible for as many people as possible. And below is one of our favourite quotes from the survey feedback. It’s all anonymous so we don’t know who you are, but you made our day. Thank you, and happy cataloguing!